When Will Justice Be Served in Bahrain? Two years after the Arab Spring came to Bahrain, protesters are still fighting rampant human rights abuses—a bloody battle that isn't likely to end anytime soon. 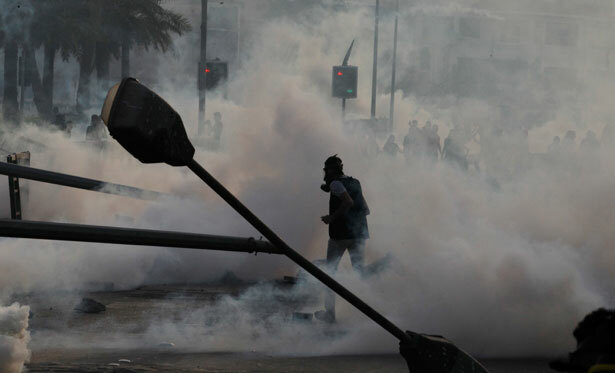 The second anniversary of Bahrain’s uprising on February 14 was marked by street protests, tear gas, shotguns and Molotov cocktails. Two protesters and a policeman were killed and dozens of people arrested. The scenes were not unfamiliar in Bahrain, which has gone through two years of upheaval since demonstrators first took to the streets in early 2011 to call for major political reforms. Since the uprising began, more than eighty people have been killed and hundreds more wounded. Scores of people have been arrested and sentenced before military courts—many of them human rights advocates, political opposition figures and physicians who treated wounded protesters. Reports of systematic prisoner abuse and torture are widespread. The Obama administration has been relatively low-key in condemning human rights violations by the Bahraini government over the past two years and has largely looked the other way as the monarchy has sought to quash the uprising. Bahrain is home to the US Navy’s Fifth Fleet, which patrols the Persian Gulf, through which much of the world’s oil passes. In January, ProPublica revealed new details of the weaponry sold to the Bahraini government by the US over the past two years, including ammunition, Black Hawk helicopters and a missile system. “Our hope is in the American people. They can pressure their government to pull their hand away from under dictatorship,” he says. Karimi is among thirty-one Bahrainis who had their citizenship revoked by the Interior Ministry in November for “damaging the security of the state,” in a move widely condemned by international human rights groups. Like most of those named, Karimi has no other citizenship. He is Bahraini but is, in effect, stateless. Bahrain’s uprising is commonly portrayed as a sectarian struggle, pitting a disenfranchised Shiite majority against a ruling Sunni monarchy. Sectarian discord undoubtedly exists in the country, where many Shia—who comprise roughy 70 percent of the population—claim to be victims of systematic political and economic discrimination on religious grounds. This is perhaps most glaringly evident in the limited number of Shia who serve in key government agencies such as the army, police and security forces. Many protesters and opposition figures blame the government for using sectarian language and trying to stoke sectarianism in a bid to discredit what they see as a rights-based pro-democracy movement. Most notably, the regime destroyed dozens of Shia mosques and other religious structures in the months after the 2011 uprising began, a move that further inflamed inter-sectarian tensions. The Bahraini government and state media often portray the opposition as being funded and backed by Iran, pointing to “terrorist acts,” and in February directly accused Iran’s Revolutionary Guards of setting up a militant cell to assassinate public figures and attack government buildings. The 2011 uprising in Bahrain comes in the wake of a long history of struggle and protest in the island nation, dating back to the late nineteenth century and a popular revolt against the British-backed ruling Khalifa family, to demonstrations against the suspension of the constitution by the emir in the 1970s and a sustained uprising in the 1990s to demand democratic reforms that took a violent turn and was met with a brutal crackdown by the regime. “We have been in revolt for more than a century,” says Salatna. The 1990s uprising culminated with Hamad bin Isa al-Khalifa ascending to power and implementing a spate of historic reforms. The reforms—such as releasing political prisoners and allowing exiled dissidents to return to the country and establish political parties—were included in a National Action Charter (NAC) that tackled issues like socioeconomic policies, citizenship rights and a system of governance based on a constitutional monarchy with an elected parliament and an independent judiciary. The NAC was approved in a February 2001 national referendum with 98 percent of the vote. Yet in 2002 the king unilaterally imposed a new constitution, which set up a bicameral parliament with an elected lower house and an upper house appointed by the king. All draft legislation must be approved by the upper house, giving the appointed chamber an effective veto over the legislative process. Meanwhile, the king has the power to appoint all ministers and the prime minister, a position that has been held by the king’s uncle since 1971. In 2011, inspired by the events in Tunisia and Egypt, organizers called for protests on February 14 to coincide with the tenth anniversary of the NAC referendum. “This uprising marks the death of the national charter a decade later,” says Salatna. For the past two years, an underground group known as the February 14 Coalition has organized frequent demonstrations, many of which involve heading toward Manama’s Pearl Roundabout, the symbolic heart of the 2011 uprising and a major landmark in the city that was razed by the regime after a Saudi-led Gulf intervention force helped crush a peaceful sit-in at the square. Activists say protesters remained overwhelmingly nonviolent in the face of a government brutal crackdown until last year, when they took to using Molotov cocktails against police. Meanwhile, the more established political opposition organizes marches and peaceful demonstrations on a mass scale. The day after the second anniversary of the uprising, the Al Wefaq National Islamic Society—the largest political opposition group—organized a march on a main thoroughfare west of the capital. The turnout was massive, with tens of thousands marching and chanting against the regime, an impressive display of dissent in a country of just 600,000. “Al Wefaq is the biggest mover of peaceful demonstrations but it is not the only one,” says Majid Malid, a member of Al Wefaq’s General Secretariat and chair of the Manama Municipal Council. Yet the February 14 Coalition, and the many youth who associate with it, are calling for an outright toppling of the regime, dismissing opposition groups like Al Wefaq as being politically opportunistic. On the morning of the planned march, a group of teenagers in the village of Sanabis all shrugged and said they would rather head to the Pearl Roundabout than take part in the organized demonstration. “Al Wefaq doesn’t represent us, they are just trying to ride the wave of the revolution to get some power,” says Yousif, an 18-year-old protester. Al Wefaq has joined with five other opposition groups to take part in a National Dialogue called for by the king involving government and pro-government representatives, the first attempt at talks in eighteen months. Yet there is widespread mistrust of the government two years into the uprising amid a continued crackdown on dissent. A group of opposition leaders arrested in 2011 known as the “Bahrain 13” remain behind bars, as do human rights defenders, most notably Nabeel Rajab, the outspoken president of the Bahrain Center for Human Rights, all of whom Amnesty International has adopted as “prisoners of conscience” in a recent report. “I don’t think the National Dialogue is useful. If the government was serious about sitting down to negotiate they would free the political prisoners, they would stop raiding houses and they would stop killing people,” says Jihan Kazerooni, a former government supporter who turned to human rights work after witnessing firsthand the regime’s crackdown on protesters in the Pearl Roundabout and the public hospital in the first weeks of the uprising. While the Persian Gulf uprising continues, Muslims are seeking justice in England’s domestic “war on terror.” Read Victoria Brittain’s report.